Combine wafer crumbs, cinnamon and butter; press onto bottom of 9-inch springform pan. Beat cream cheese and sugar in large bowl with mixer until blended. Add sour cream and vanilla; mix well. Add eggs, 1 at a time, mixing on low speed after each just until blended. Transfer 3 cups batter to medium bowl; stir in melted chocolate. Pour over crust. Bake 30 min. Meanwhile, stir liqueur and orange zest into remaining batter; refrigerate until ready to use. Reduce oven temperature to 325°F. Spoon remaining batter over baked chocolate layer in pan; bake 30 min. or until center is almost set. Run small knife around rim of pan to loosen cake; cool before removing rim. Refrigerate cheesecake 4 hours. Heat marmalade just until warmed; spoon over cheesecake just before serving. Looking for a special treat? 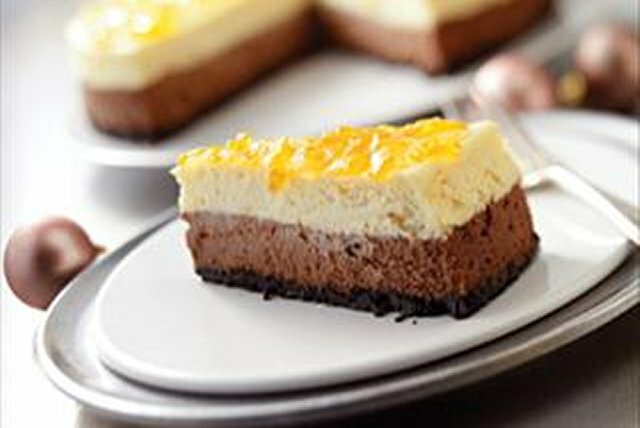 Orange and chocolate make a wonderful combination in this cheesecake. If using a dark nonstick 9-inch springform pan, reduce oven temperature to 325°F for the crust-baking step, and to 300°F for the cheesecake-baking step. This showstopping cheesecake can be refrigerated up to 24 hours before serving. Substitute orange juice for the orange-flavored liqueur.